manual (key) or automatic control, a keyboard or input converter of electrical signals into the code according to which the punching is done, and a feed mechanism for the recording medium. 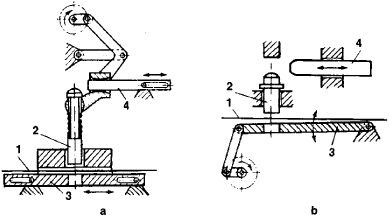 The chief parts of the punching mechanism (see Figure 1) are the punch pins (usually round or rectangular in cross section), matrices with holes for the punch pins, and a blocking pawl to prevent punching. A punch may be driven by mechanical, electromagnetic, pneumatic, or hydraulic means. Also often classed as punches are auxiliary devices such as ticket punchers and spot punches, used to correct data on punched cards and tapes. Anisimov, B. V., and K. S. Khomiakov. Ustroistva podgotovki dannykh dlia elektronnykh vychislitel’nykh mashin. Moscow, 1972. (shortened from Punchinello, a distortion of the Italian Pulcinella), a character in the English folk puppet theater. Introduced in England by Italian puppeteers in 1662, Punch eventually became a permanent jester’s mask in the puppet theater. Since the end of the 18th century, Punch—as a hand puppet-has been the central figure of a puppet show. As a rule, he embodies the anarchic revolt of the lower classes against the feudal-bourgeois establishment, thus winning popularity with the viewers. Speaight, G. The History of the English Puppet Theatre. London, 1955.
a tool resembling a nail that is used for engraving on metal. The blunt end of the punch is struck against the plate and forms indentations of various sizes and shapes. (1) In metalworking, one of the basic parts in machines used for stamping and extrusion. In stamping, the punch exerts direct pressure on the metal being worked; depending on the purpose, the operation may be classified as piercing, perforating, slugging, or blanking. In extrusion, the punch transmits pressure through the dummy block to the billet being extruded through the die. Punches are subjected to high mechanical loads and, in case of hot-working processes, to thermal loads. For this reason, punches used in cold-working processes are fabricated from high-strength steel with a greater depth of hardening; punches for hot-working processes are fabricated from wear-resistant steel with higher strength at temperatures of deformation. (2) In printing, a steel slug of rectangular cross section having a letter, symbol, or similar item in relief, used to make intaglios in the production of dies. A device for making holes representing information in a medium such as cards or paper tape, in response to signals sent to it. A hole in a medium such as a card or paper tape, generally made in an array with other holes (or lack of holes) to represent information. A tool that forces metal into a die for extrusion or similar operations. 1. A small sharply pointed metal tool which is struck with a hammer and used for centering, marking, or starting holes. 2. A steel driving tool with a sharpened edge, used to cut holes in sheet metal.